Product Details-Made with super-tough fire hose material,Keeps squeakin even if punctured, No stuffing means no mess,Durably designed with an engaging array of shapes, sounds and textures,vailable in 2 and 3 squeak versions. 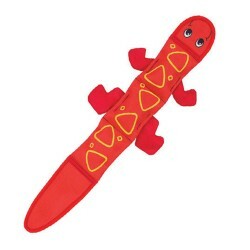 Product Information-Treat your pup to long-lasting fun with Outward Hound Fire Biterz Doggy destroyers have met their match with these tough, but lovable lizards. Constructed with real fire hose material, these toys are stuffing free and include Invincibles squeakers that keep squeaking if punctured! It all adds up to long-lasting fun for your furry friend.